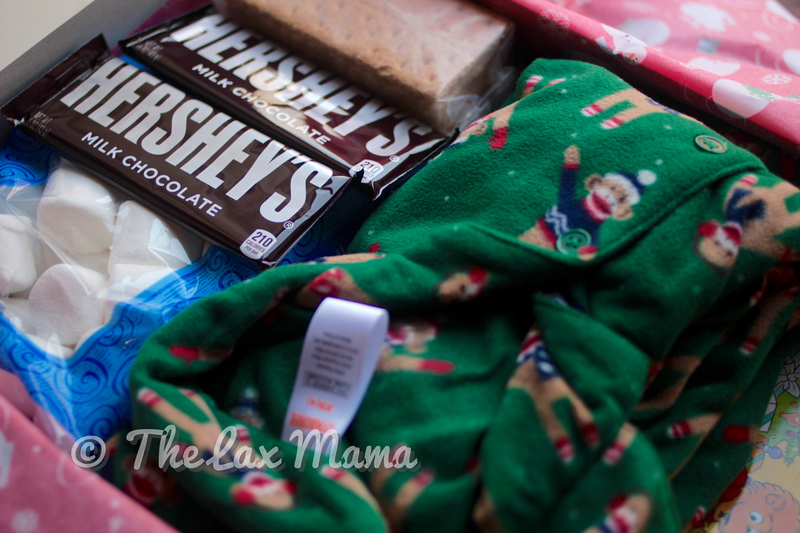 The Lax Mama | Eat. Poop. Play. Sleep. Repeat. For Lent I’ve given up Facebook. I deleted the app from my phone and deleted the bookmark on Chrome, all in an effort to be more present in the moment. It’s only been a week and I find it easy and yet hard to be away from Facebook. It’s easy in that I really don’t miss it. It’s hard in that everything seems to some how be connected to Facebook in one way or the other. I now get my news from the radio, TV (as usual), and more and more Twitter. God, Twitter is just so incredibly refreshing! Like most, the first thing I used to do in the morning is check Facebook. And no doubt many of my Facebook friends would share pieces of information about their favorite stars or latest piece of news. While it is good at making news disseminate faster than TV news, it slowly began to be clogged with terrible noise. In particular, a Facebook friend would constantly share at least 3 articles a day from a conservative blog editorializing the terror that is the Obama administration and not once citing any credible source. Right before I went on my Facebook cleanse, I specifically complained to my husband about a particular person who posted an article stating that the Zika virus was a GMO created by the government (citing other blogs, not one citing any reputable science journal). It made me realize Facebook was turning into my AOL e-mail account and the countless drivel saying that I would die if I didn’t forward this e-mail to 10 of my friends. It’s great not having to sift through these terrible posts. But it’s kind of hard. I mean I don’t miss it. But everything in the world is freaking connected to Facebook!!! Websites, apps, everything wants you to sign in to Facebook. They make it really hard to not sign up without Facebook too! Do I want to share this on Facebook? Do I want to sign up for this class using my Facebook profile? No thanks! We’ve also had snow this last week and the inevitable closings. A lot of people update their business status via Facebook! I get it; it’s a lot easier to update your business Facebook page to say that you’re closed due to snow than your website. These mom and pop shops don’t have IT people to do this for them because they take a pre-made website and they, themselves, slap their stuff on there to save money. That’s one thing that has been super annoying. I’ve actually had to call a place to see if my daughter still had a her class. Can one really be free of Facebook? Overall I’m surprised at how I don’t miss Facebook at all. Perhaps it will be a new habit? OMG, I haven’t updated in a month!!! It has been quite a hectic last few weeks with the holiday season. Hope everyone enjoyed it with family. And now it’s 2016!!! How the heck did that happen?! Anyhoo, here are my resolutions for this year. Try to be off the grid more! Is that possible in 2016? Yes and no. For me it means to check Facebook less. I am really aiming to not be the parent that has their head buried in their phone while their child is happily playing independently. While I still want my children to learn to play independently, I still want to observe the little quirks that make them unique. If that at all makes sense to any of you. The goal is just to stay present in the moments and take it all in. However, you’ll still find me taking a few videos or photos for Instagram. The one thing I miss about SF are the mom’s I met while there. While I have mom friends here, we rarely were ever away from the kids. Not that there’s anything wrong with that, but it’s also difficult to have a very meaningful conversation especially now that our children are walking. It’s usually a quick chat about a topic for 2 minutes before our children wander away from each other. So I am trying to organize a monthly mom’s night out; away from the kids, away from the husbands so that we can reconnect as women over cocktails and food. The first one went really well. I just need to plan that second one. 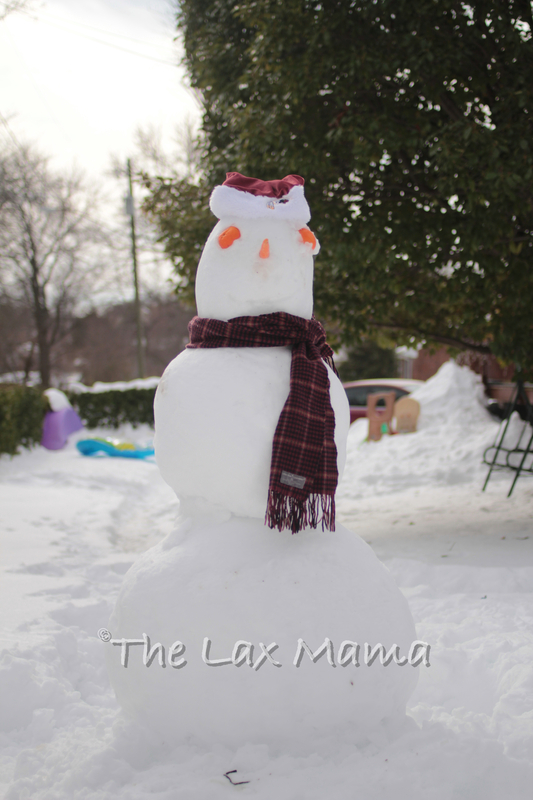 Since moving back to the DC suburbs, it is really really easy to fall into that sedentary lifestyle–just sit on the couch or park bench and watch the kids play. There’s just something culturally different between the East and West Coasts and our views on activity. While I still play soccer, that’s not nearly enough to what I was doing in SF. Granted the weather is a lot warmer and nicer there, that’s still not an excuse to not be outdoors and enjoying life. So I’ve been taking advantage of the wetland preserve a mile away, which my son loves. I have a zoo membership this year, which both kids absolutely love doing. And we’ve gone to museums, which thankfully are mostly free here in DC. We still walk to our local playgrounds. But it’s nice to go out on a hike or walk, especially now Sammy just wants to walk all over the place (forget about baby wearing or stroller walking). I still primarily use my iPhone to take pictures, but this year I really want to start using my DSLR more. I used it a lot during my son’s first years of life, but I just haven’t done so with my daughter. I always end up forgetting to bring it, but more often than not I’m just lazy about taking pictures. This year it will change, even though I haven’t used it yet this year!!! But we have some amazing trips (both with and without kids!) planned this year, so it will definitely encourage me to pull it out and use it more. So those are my resolutions that I hope to keep up this year. I feel like it won’t be difficult, and I don’t want to say kids are the excuse. What are your resolutions this year? 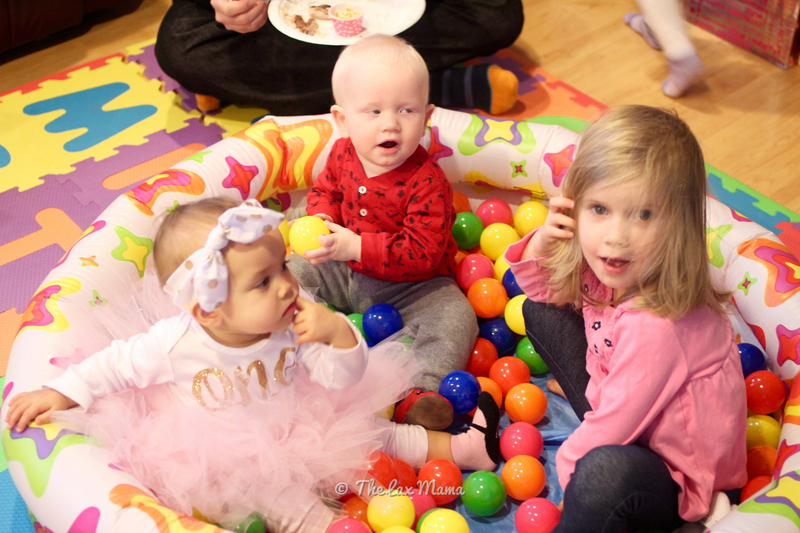 So we celebrated my daughter’s first birthday over the weekend a few weekends ago. First and foremost, that first year went by super fast. I know it went fast with my son, but boy does it just happen faster with the second. I feel like she was just born and suddenly she’s walking, talking, and turning more and more into a little girl. But enough with the tears, you probably are interested in the party details for inspiration for your next soirée. First, I didn’t quite have a concrete theme like cars or a princess party. I did, however, have a color scheme in my head–pink and gold with hints of black. So I went to Michael’s and bought the supplies, which included a lot of cardstock. They had an ombre pack of pink cardstock, and so then it evolved into ombre pink and gold with hints of black. 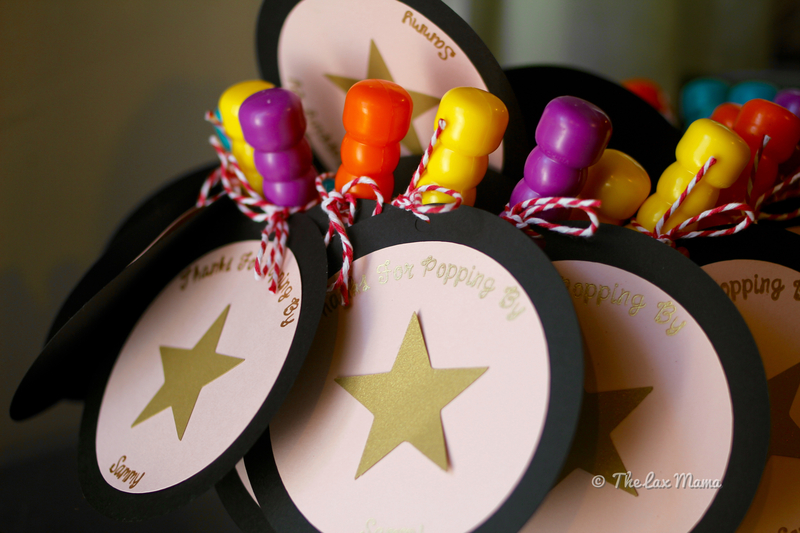 I then ran with it when it came to party decorations, and that soon evolved into ombre pink circles and gold stars. All our younger guests hung out in the play area where our kids have all their toys. I also bought a cheap blow up baby pool and created a ball pit. This was such a hit at the party; even the 9 year old loved hanging out in the pit. I arranged the seating to be against the wall so that the parents can watch their kids playing in the middle. 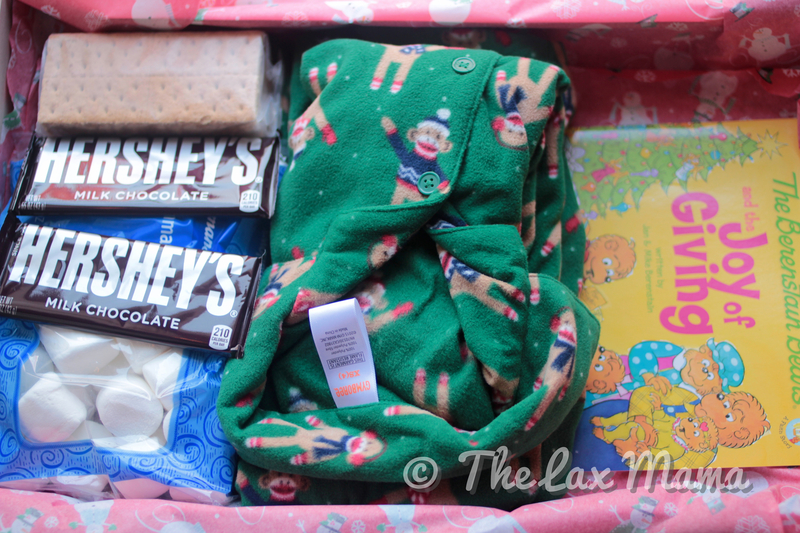 I also set up a kiddie snack table for the toddlers/kids. 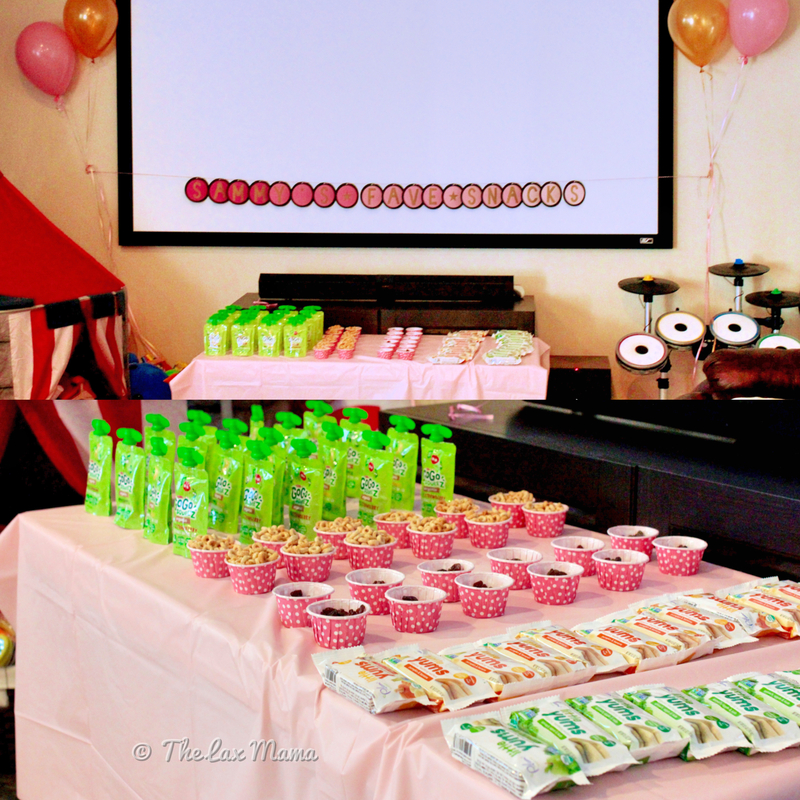 I created the bunting with my Silhouette Portrait, some craft tape, and pink twine, and it says, “Sammy’s Fave Snacks.” We have an adjustable height table that we used to make the snacks accessible for our little guests. I put out some apple sauce, teething biscuits, raisins, and Cheerios. In hindsight, I should have probably put the Cheerios and raisins in a resealable bag since one of the tots decided to dump all the raisins into one big pile on the table. I also made these buntings. The top one I used two different sized circle hole punches and a star hole punch, and then a sewing machine to string them all together. It was actually pretty simple and my son liked to collect the different shapes and put them into piles for me. I made 2 different and very long ones that we strung up around the house and cut down to size. 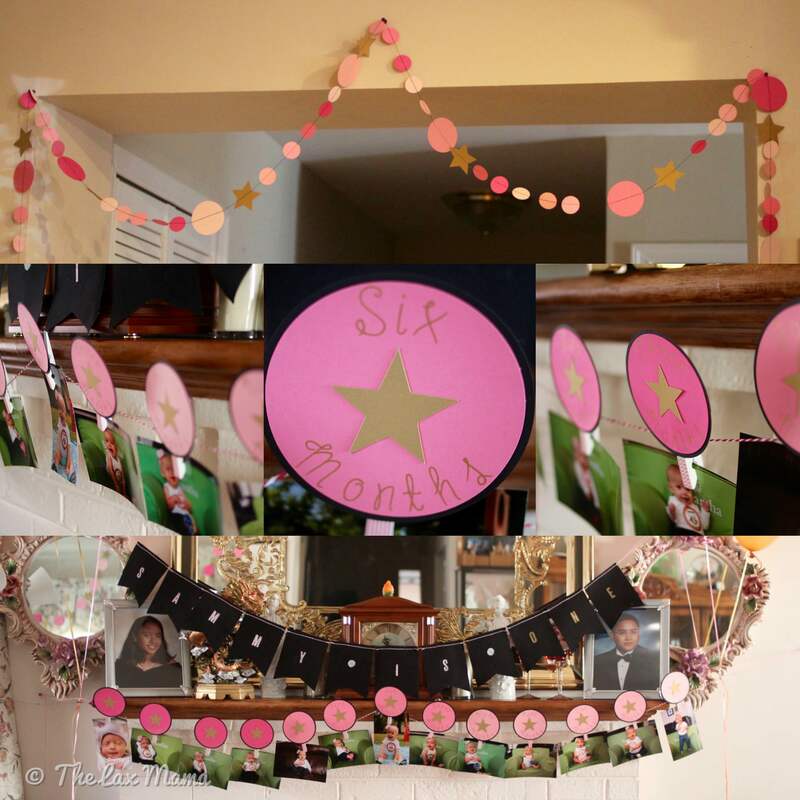 The middle set of pictures is the monthly picture bunting I made, again using my Silhouette Portrait, craft tape, a hot glue gun, clothes pins, and pink twine. I then printed the pictures at Costco and they were ready in an hour for $.17 each I think. The bottom picture is of the monthly picture bunting and another bunting that says, “Sammy Is One.” I made that bunting with acrylic paint, stencils, black canvas bunting panels that were black, and then strung them together with pink twine. For Sammy’s high chair, I used the same blank canvas bunting panels to make the ONE, and strung it up with pink twine and just taped it onto a high chair. 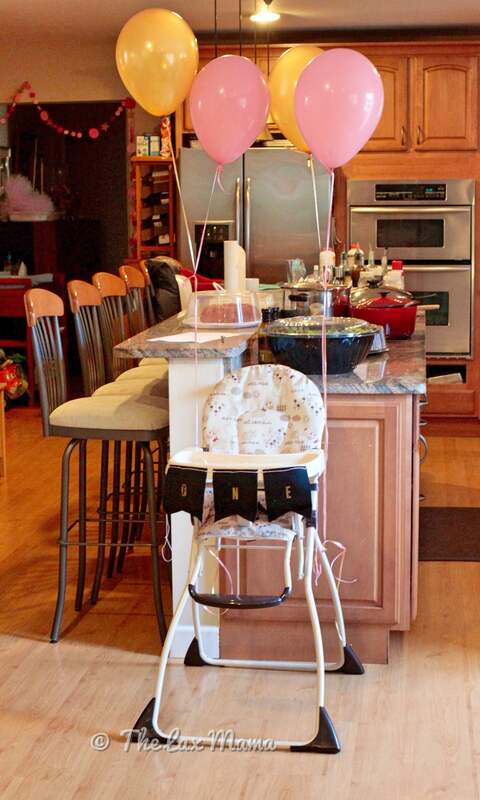 And then we just added some balloons to make the chair more festive. The bottom picture is the cake table. The left is the cake for all of our guests and the right cake is her little smash cake (which Sammy was sooooo not interested in at all). They were made by a local baker called Occassionally Cake. They made my baby shower cake, and they did a great simple job on my daughter’s cake. And the cakes were sooooooo good! I also did the first year stats on my Silhouette Portrait. It was actually a bit of a pain at first–basically if you have fonts with a lot of intricate designs, it made Silhouette Studio crash. After tinkering around, I found something that worked and I’m actually really pleased with the design. It actually isn’t that hard to change out the pens to have it write what you want. I then got a frame from Michaels, that also happened to be 50% off. So a fairly cheap project that looks really great. Finally, the party favors. I bought the mini bubble wands from Oriental Trading for fairly cheap. And the tags I made with my Silhouette Portrait. I then attached it with pink twine. 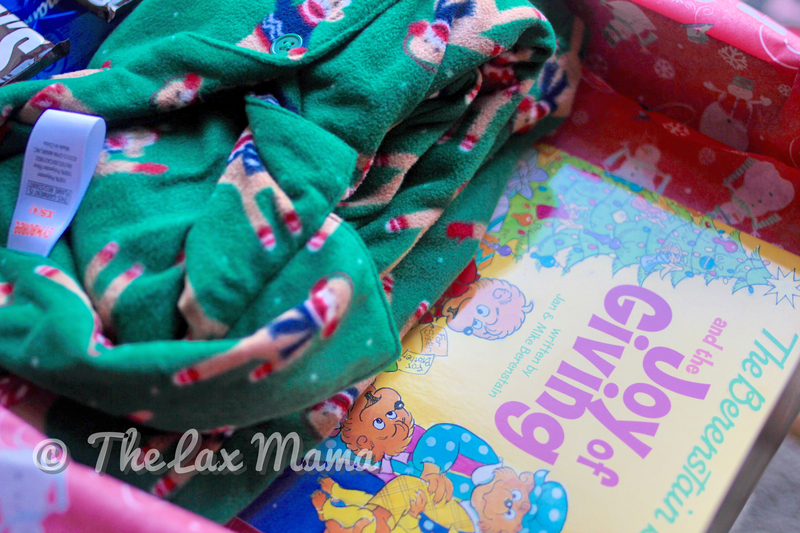 These were a great give away for kids since the age range of our young guests were 10 months to 9 years old. Everyone loves bubbles! I stuck them in an old pink Easter egg bucket and put it by the door so I wouldn’t forget to give them away to the kids. Overall, the party went well. Everything that I made was fairly simple and easy to whip up, so didn’t take up much time overall (although I did spread it out over a month and many many many trips to Michaels). I also think the pink ombre and then adding gold and black accents helped to deaden that in-your-face-pink you see with some girl birthday parties. Basically I was looking to do something feminine, but also not gaudy. 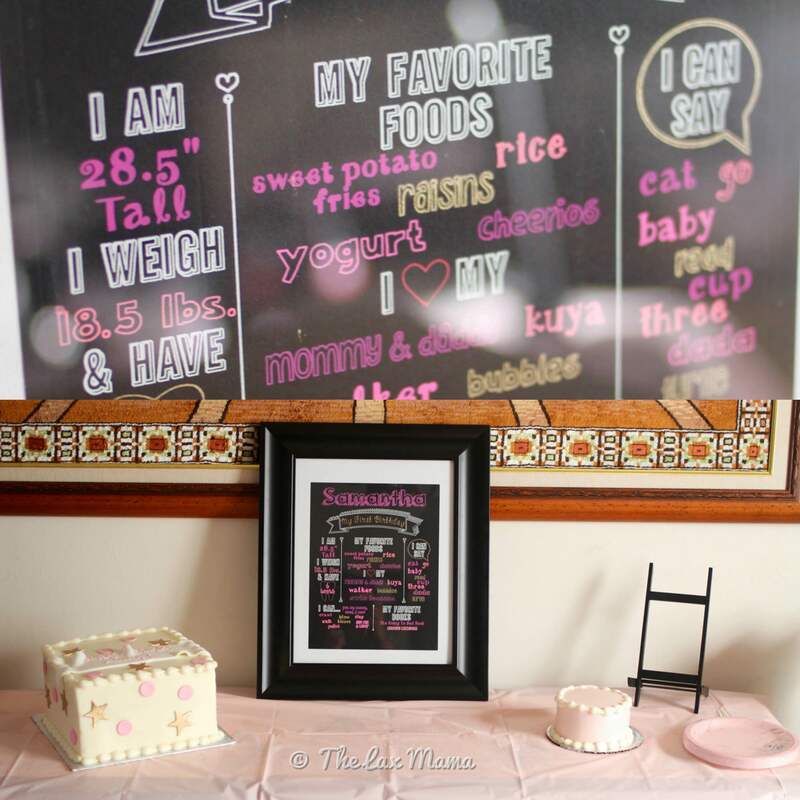 Hopefully I achieved that and have sparked some ideas for your next party. …it pours. That’s the saying, and it can feel like that as a parent. Take my Thanksgiving Weekend for example. On Tuesday, my son stayed home from preschool because he threw up twice before we could get him out the door for school. He even threw up in our bed, and I had to put our sheets in through the wash twice just to get all that milky vomit out. Sorry, TMI. Later that afternoon, I left him at home with my parents so I could take my daughter to her regularly scheduled Gymboree class. She was just fussy the entire time and was not into anything, including bubbles. Now that made me raise an eyebrow. We got home and I tried to give her lunch, but she was not having it. She was still feeling really hot (it is usually really hot at Gymboree), so I took her temperature and it was 104! So I gave her Tylenol and let her cuddle and eat/drink anything she wanted. The next day my son was fine. I think my husband gave him rotten milk. So my son went to school and I was left to tend to my still feverish daughter. More Tylenol, but at least she was eating a little bit and would play a little. On Thanksgiving she still had a low fever, but she was just clearly not herself. Usually she is very happy in the mornings, and when she was sick she would still try to communicate she didn’t want anything. But that morning she was a bit lethargic. So we called the pediatrician and they saw her that morning. Turns out that she had an ear infection–her first. An escript was sent to our local pharmacy, picked it up, and made it back home all before lunch and in time to start cooking the side dishes for Thanksgiving dinner. Friday she was feeling fine, but we still kept her home just because. Saturday she started developing a rash on her head, but I thought it was probably the new headbands that I bought her. I had her try them on before I washed them. So I thought that perhaps it irritated her skin. Or maybe it was a heat rash from her wooly hat I made her wear when she went outside for a walk even though it was pretty warm outside. When she woke up from her afternoon nap the rash then spread all over her body. So I called the pediatrician’s office. The doctor told us to stop her antibiotics and to call Sunday when the office opens so they can see her that day. Sunday morning the rash was all over her body, so we called the pediatrician and again were seen that morning. I was worried that she may have a penicillin allergy like me, but the pediatrician said it looked more like a viral rash. But the good news was that her ear infection was gone. So it was a pretty hectic long weekend for us. But I am so grateful that our pediatric practice offers emergency hours on holidays and weekends. 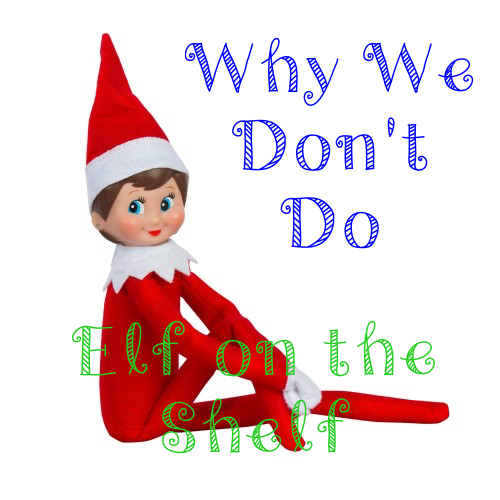 We could have easily gone to the emergency room or an urgent care facility. And while these facilities are great, most urgent care facilities don’t know much about pediatrics (our lone experience, they sent us to an ER for just a run of the mill viral infection). We also aren’t exposing my daughter to really sick adults and tying up an ER for something that’s not an emergency, like an ear infection. Plus it was nice seeing a pediatrician we were familiar with, and who had notes about her (we were in the office the previous week for her one year appointment, and the doctor noted that she had fluid in her ear but it wasn’t infected, and that’s the ear that later got infected). I hope everyone had a very good Thanksgiving this year! And I promise I’ll post about my daughter’s first birthday party soon! I started it, but then life happened.